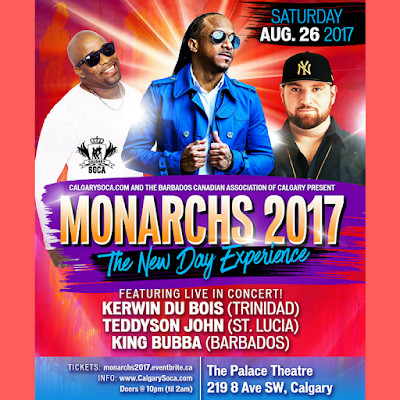 Calgary's biggest Soca concert, MONARCHS 2017 returns! CalgarySoca is proud to present 2017's biggest Soca Concert in Alberta! MONARCHS 2017 is all about multi talented Soca artistes in Calgary's best concert venue, The Palace Theatre! On Saturday Aug. 26th, Superstar writer/producer/artiste KERWIN DU BOIS out of Trinidad, is alongside the multi talented St. Luican, TEDDYSON JOHN to bring their 'New Day Experience' to Calgary; and are joined by the massively popular 'Bajan' sensation, KING BUBBA FM. Advanced tickets $45 Limited Early Bird Tickets on sale July 3rd 2017.